The original since 1924 . . . . the red oil that creeps . . . .
Quick Smart Products Penetrene Oil is the unchallenged heavyweight protectant, lubricant and rust penetrator. Penetrene has been specifically designed to meet the needs of automotive and industrial users, trades people and professionals who expect nothing less than the best. Unlike similar products Penetrene’s unique chemical composition keeps on working. The solvent base doesn’t evaporate as quickly as others which allows the lubricants to keep penetrating. Industrial strength Penetrene has a superior ability to penetrate rust and grime, lubricate moving parts and protects all metal tools and parts from rust and corrosion. Penetrene is now available in a convenient 400 gram aerosol, handy 250ml and 500ml squeeze bottles, 1 litre pump spray, a bulk 5 litre and 20 litre pack as well as an all conquering 200 litre drum. “It’s still the same old Penetrene, we’ve just upgraded the packaging”. 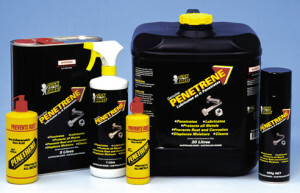 Penetrene has hundreds of uses in the workshop, on the job and around the home. For long term protection of metal surfaces against rust and corrosion … outdoors or indoors. Soft Seal is a petroleum based, protective coating that forms a light amber transparent film .5 to 2mls thick. It never becomes brittle and will not craze. It is highly resistant to salt water and salt spray, making it particularly useful as a long term, outdoor rust preventative. Soft Seal may be used “as is” or diluted with petroleum solvents (mineral spirits, naphthol spirits, stoddard solvents).